These inspirations became a constant theme in her work which consists primarily of portrayals of human bodies during injury or illness, as well as different anatomical parts of the body. An interest in the beauty and complexity of the human anatomy can be seen in the works of previous artists such as Leonardo da Vinci’s famous Vitruvian Man, De humani corporis fabrica, by Andreas Vesalius, as well as Peter Paul Reuben’s, Anatomical Studies: A Left Forearm in Two Positions and a Right Forearm. 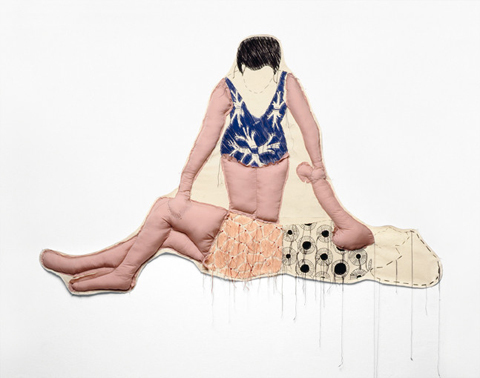 Hotz creates her forms with cautious embroidery as well as the occasional inclusion of stuffed fabrics to give the forms a more three dimensional and life-like quality. She often references the shape of organs to develop her forms and patterns as well as the repeated pattern of human veins, cellular structure, and muscle lines. The universal interior of the human face is brought to the surface in her work entitled Face from 2005. We are comfortable with looking at each others faces, but she stirs feelings of discomfort by going a layer deeper and revealing the muscles that shape our familiar exterior façade. Her ability to have thread make you feel uncomfortable is fantastic. 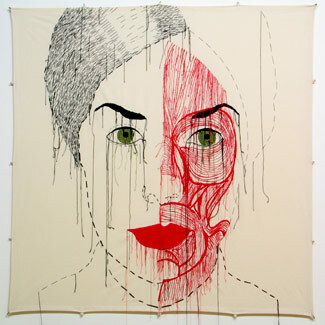 In 2008, Hotz’ work was shown at the New York Museum of Arts and Design in the show Pricked: Extreme Embroidery. There, she was among 48 other contemporary fiber artists whose work, like hers, demonstrates new, innovative ways of approaching the centuries old craft of needlework. She has a distinct style which you can see continues throughout all of her work. Hotz maintains a muted, more natural color scheme which mimics the color scheme of our interior bodies. She leaves thread hanging loosely from the work, giving it an unfinished look, which compliments the incomplete narratives in which her characters tell while in media res, and also references the fragility of the human body. Thrombosenkelch is a scene involving two girls entwined in an intimate and fierce moment of wrestling. Contrastingly, Hotz has given the figures a soft, plushy quality as they engage in a painful game of violent beating. The absence of gore in seemingly gory scenes adds to her list of fascinating ideas and also adds a playful nature to her work. 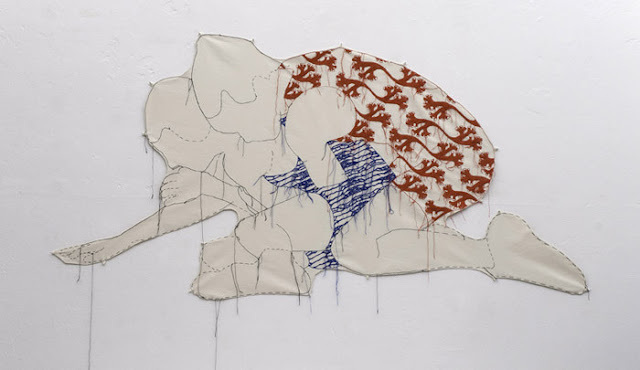 Hotz has successfully manipulated her medium to create a multi-dimensional series exploring the human condition, the fragility of the human body, the struggle for survival, and the interior that delicately lies beneath the exterior. This dedication to the materials helps move fibers art up into the fine art world and away from the dainty craft world it has long lived in.